Little ones love ride-on toys. A ride-on toy is a toy that the child sits on or in and propels with their feet. There are many different styles and types of ride on toys from little cars to motorcycles to animals. With all of these choices you may be at a loss in deciding which one is the best for your child. The best ride on toy is made from durable, long lasting materials from reputable companies. 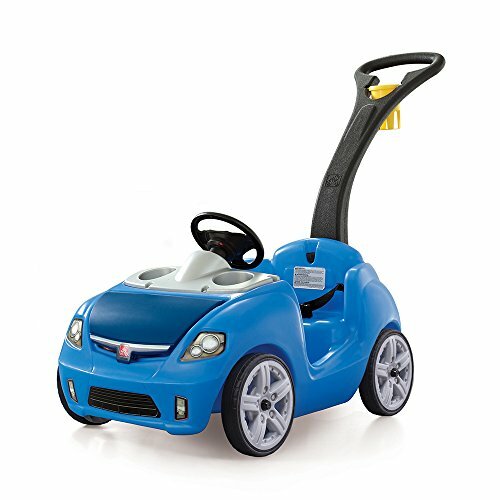 Our pick, PlasmaCar, is one of the most popular and well known ride-on toys on the market and we can see why. There are some things to think about before you start looking around at all the different choices. The purpose of this buyer’s guide is to provide you with the information you need to compare the different ride-on toys and find the one that will be perfect for your little one. Ride-on toys are typically designed for children 1-3 years of age although most ride-on toys last a lot longer than a couple of years if they are taken care of. Choosing the right ride-on toy for your child enables them to feel like a big boy or girl and fosters their imaginations as well as encouraging physical exercise. They are also good for improving coordination and balance. Your goal is to get the information you need to choose the right ride-on toy for your child’s age and skill level. Choosing something a little challenging is fine but you don’t want to choose something that is so challenging they get discouraged. Your child will love riding around on this ride on toy on the sidewalk or driveway. It provides plenty of exercise and activity that will increase coordination and muscle strength. This toy is best used on a hard surface that is flat such as sidewalks, concrete driveways, and doesn’t do well on grass, gravel, carpet or any softer surface. The PlasmaCar ride on toy has no gears, motors or pedals. It is easy even for a very young one to use but it best suited to children 3 and up. 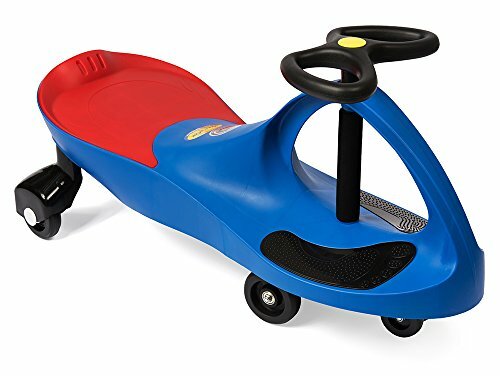 This durable and long lasting PlasmaCar ride on toy is made from high quality materials that will last years. It is available in many different bright colors and can be ridden indoors and outdoors as well. (Remember not to use it on carpet, but tile or wood floors will work just fine). Step2 is another popular and well loved name in children’s ride on toys. Quality and durability are their trademarks, creating toys that last years. This self-propelled ride on car is easy for little ones to push around with their feet. It features a sleek design and smooth, quiet wheels. The Step2 Whisper Ride Buggy has two cup holders, one for the little one and one for parents. It also features a long handle that the parents can use to push the little ones like they would a stroller. This handle folds underneath the body of the car for easy storage. There is extra storage under the hood that the child can carry their special belongings. Maximum weight is 50 pounds making this toy perfect for ages 1-3 years. There is some assembly required that will need to be done by an adult. Little Tikes has set the standard for children’s ride-on toys and climbing toys for decades. 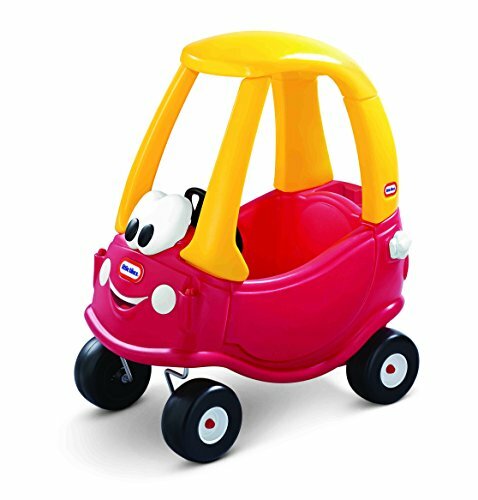 This adorable cozy coupe will be your little one’s favorite toy inside or out. It has storage in the rear of the little vehicle and a high seat back. Other features include a removable floor and a handle on the back for parents to push them on walks. The little gas cap opens and closes and it has an ignition switch as well. The Cozy Coupe is powered by your little one. When they climb into it their feet will be on the ground and they can propel themselves around with their legs. It has tough, durable tires and front wheels that spin 360 degrees so it can pivot. The brightly colored Cozy is red and yellow and has a little face on the front. This is the perfect toy for your little one age 1-3. Ride-on toys include child-sized cars, bicycles, motorcycles, and rocking horses or other animals with wheels. Some ride-on toys are motorized. Ride-on toys provide a lot of benefits to your child. They encourage outdoor play and physical exercise; help with motor skills and coordination and foster a good imagination as well. There are several things that you want to take into consideration when you are researching ride-on toys; the age of your child, safety, their skill level and many other things. The purpose of this buyer’s guide is to help you match your child with the perfect ride-on toy that they will love playing with. The three wonderful ride-on choices featured above are from respected and well-known companies in the toy industry. All three are top rated toys that are made from long lasting, quality materials that can handle a lot of daily use. If none of these top rated choices appeal to you, use the information in the following buyer’s guide to learn more about the different types of ride-on toys. This information will help you eliminate the toys that are not suited to your child’s age and skill level and will enable you to make an informed decision on a ride-on toy that your child will love. There are several things to look at and consider when you are researching different ride-on toys for your child. We have listed all of the important things that you want to include in your research. These points will help you make a great choice for your little one. Safety Features – Safety is always the number one concern of a parent. All ride-on toys have a risk of tipping over or bumping into objects. You can minimize the risk of these safety issues by looking at the different safety features that each ride-on toy has. Wider bases that reduce the likelihood of tipping over, brakes on bicycles, and other features that are designed to minimize injuries. Get your child into the habit of wearing protective gear, even if they are riding on a ride-on cycle, especially if they are little and still a little bit unsteady. Balance – Make sure that the ride-on toys you are considering have a low center of gravity which will reduce the likelihood of tipping over. Look for wheels that are widely spaced that will provide more stability and will support the child’s weight safely. Read customer comments to see what parents have to say about the stability of the toy. If there is a problem with it tipping over a lot, parents will be commenting on that. There are ride-on toys that are better suited to certain age groups that others are. You should look at ride-ons that are designed for children the age of your child. Purchasing one that is too young or too old will only frustrate the child. Also look at their coordination and balance skills. A young one year that has just started walking would not be paired up well with a toy that requires them to have a lot of balance. We have provided information below that matches the age of the child with the type of ride-on toy. Wagons – These are toys that the child can ride in and be pulled by the parents or older children. If the child is walking well, they can pull the wagon around with their stuffed animals or other important toys in it as well. A young child should not be pulled in a wagon by another child that is not old enough to understand and follow the safety rules when it comes to pulling the wagon. Wagons are good toys for children of all ages. Rocking Horses – This kind of ride-on toy is stationary and can be the perfect choice for a young child age 1 to 2 years old. Balance is important to sit on the rocking horse without toppling over. Foot-Powered Toys – self-propelled ride-on toys are a great way to introduce more advanced ride-on toys that involve balance and pedaling. All three of the ride-ons that we have featured above are foot powered ride-on toys although a couple of them have handles that can be attached for the parent to push the child on the toy with. Foot powered ride-ons can either be straddled or the child fits inside the toys with their feet inside and open to the flooring or ground below. There are benefits to playing with ride-on toys for children of all ages. We have listed these benefits below. Coordination – To pedal a bike properly a child needs to have a degree of coordination. When they are first walking and moving around they may not have the coordination necessary to pedal a ride –on. Tricycles, toy motorcycles and similar toys are all pedaled and good for children 3 or above. Exercise – Self-propelled ride-on toys provide your child with the chance to get some much needed and healthy exercise with very little effort. So many children spend their time in front of televisions, tablets, video games and the computer even as young as 3 years old. An engaging, fun ride-on toy can encourage them to play outside and use their arms and legs to move the ride-on toys around. It is exercise that will not feel like exercise to them. Balance – Ride-on toys foster an excellent sense of balance. It takes balance to be able to stay on the ride on and move it around with their little legs. Ensure the stability and safety of the ride-on and be nearby in the event they do topple over while they are learning and gaining more balance. Imagination – Pretend play is very important for the healthy development of your child. Riding around in a Cozy Coupe or on a motorcycle can inspire all kinds of pretend play. This is great for the child’s mental development. Having a variety of ride-on toys around for your child encourages creativity, imagination and lots of physical activity. They can start playing with ride-on toys as young as 1 year of age and can continue to play with different types of ride-ons on into the teen years. Of course the ride-ons will be geared toward teens but the premise is the same, as are the benefits. The information in this buyer’s guide is designed to help you determine the skills your child has and choose a ride-on toy that is age appropriate as well as appropriate for their skill level. The right knowledge will make sorting through all of the choices much easier and less overwhelming. Choosing a child’s toy should never be overwhelming. The right knowledge gives you the confidence to make these decisions and not have to worry about whether they are the right ones or not.